The Prombank Group of Companies has evolved over 50 years by valuing quality and responding to the demands of the market. Here is an organization that understands bricks and mortar, opportunity and investment. In its early founding days, Prombank was exclusively a builder of fine homes. Today this second generation private enterprise has adapted to the changing and developing needs of communities that are on major arterial routes and interchanges with short commutes to or from Toronto. 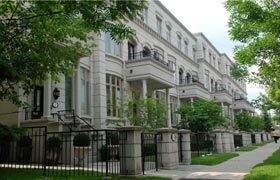 Industrial, commercial and residential properties in Woodbridge, Etobicoke, Brampton, Mississauga, Toronto, Richmond Hill, Whitby, Oakville and Milton stand as a proud legacy of this builder and developer's work. By investing in the right people, Prombank has survived and thrived across five decades. Here there are strengths that extend beyond a single project type. There is practical knowledge and experience applied to solid evaluation, site specification, quality design-build and leasing management. The Prombank Group of Companies understands at its root that it is the long-term tenants and satisfied customers who are the best evidence of work well done. The future will depend on equal measure of legacy and ingenuity. The Prombank Group of Companies is ready. Please peruse our web site and let us know how we can help you. Your success is our success!